Edited to fix the typo in the subject - typos are killing me today, grrrr. The plan is to put those new weapons first in the Bundle Shop and then sell it in the Trade Goods Shop on a different day like we did with the Morgan Staff/BBQ/Flare gun and others. But that can take a while to happen, so I wouldn't be counting on that for now. As long as it's after the next council update and not before I'll be happy with that . As we're 4 months down the line from the last one and the next has been confirmed to happen this year I wouldn't want to buy a weapon for it to be obsolete in a couple months! Even a low-level concussion rifle with be worth its weight in gold on several Distance maps! That's why I bought the first one and I hardly spend on this game. It’ll need gold spread otherwise limited use. Silver might be ok however there are distance maps where you have to have gold spread to hit all walkers when positioned in a corner. Is this Rositas weapon or something new? It’s new and should be in your bundle shop now. Gold concussion and charging, silver widespread. Uggg, that's tough. If only they'd have flipped charging/widespread. Rositas is gold concussion/widespread correct? might have to wait for that to come back. Yep, gold concussion/widespread and silver lethal. Perfectly traited. Agree this one needed charging and widespread swapped. Is a really cool weapon, but I can't rationalize the spending without gold spread. Useless to stun a bunch for 2 rounds while that one in the corner comes and grabs you... Then RIP. it sure is pretty tho. I went ahead and bought it. Completely agree that it would be way better if the charging and spread were switched, as I would much rather have gold spread, primarily for the Distance maps referred to by @Cronus. If the charging had been lethal, I probably would have passed on it, but charging sold me on it. Stunning walkers for two rounds gives you ample opportunity for kills, which leads to more charging, which leads to more stunning, and so on and so forth. I can see this weapon being a huge asset deep in challenges - Archives anyone? Charging trait I think will make this weapon an absolute hoss in lower levels, every other round a critical attack, but vs high level distance maps, an assault without piercing...? Won't be killing anything to charge up. Other than Sasha assist, which doesn't interact with charging trait. If this was in response to what I said just before that, I was referring to high level challenge maps, not Distance. Nevertheless, NO weapons are very effective on their own at high level Distance maps, piercing or not, except for a select few single target weapons like a knife with silver charge, gold lethal, gold destructive, or a pistol with equivalent traits, and even then, you still need to have your survivor jacked the F up with badges, the right traits, and a charge attack ready to go. Thus, this particular rifle won't be any different from almost any other weapon - speaking strictly from a damage perspective - in high level Distance maps. But that concussion trait will sure as hell come in handy, and the charging is a nice touch on top of it. Back to my point, though...the charging trait on it will certainly be effective on high level challenge maps, for me anyway. I usually go to L33, so I can't speak for the beasts who get up to 37 or higher. Bottom line, I dig the gun. Certainly everyone is entitled to their own opinion, but I like it. (and yeah, I would like it more if the charging and spread were switched ). If I didn't have Rosita's Assault Rifle I might be tempted by this one, however since I do I can't seeing grabbing this weapon over that one. I use Rosita's all the time at higher levels and if I have a 2nd assault typically they have weapon with gold widespread/piercing or gold widespread/lucky depending on the leader and/or map. @DBones please report back how this one works out for you! I have the legendary Rosita rifle bought with trading goods and its one of my main weapons. I am tempted to buy it but it getting obsolete in 2 to 3 months puts me off. Hmmm, how about a high tech banana knife which automatically upgrades with each council update and has all the traits and special functionalities of melee and ranged weapons and NG pays you 1,000 bucks for purchasing it. That banana stuff just gave me an idea. How about we will get special throwing weapon for example for scouts. With some extreme damage, 100% critical multiplied two or three times each time being throwned. However, the only caveat - if you throw it, you need to get to the body to pick it up. So if one throw it in the middle of the group, it wont be that easy to get it back. When the walker is next to scout, it can be regular weapon, it's jut the throw that would trigger some different behavior. Hehehe figured after 4 months it was worth another try? Well bully-up and let's see a poll. I'll vote for it @MudMoccasin ! 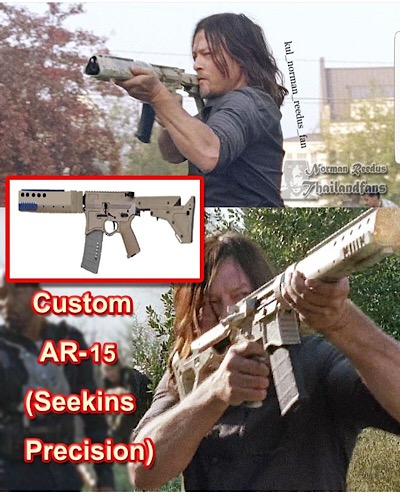 However, did ya want Rifle (previous post) or Assault (recent post)?